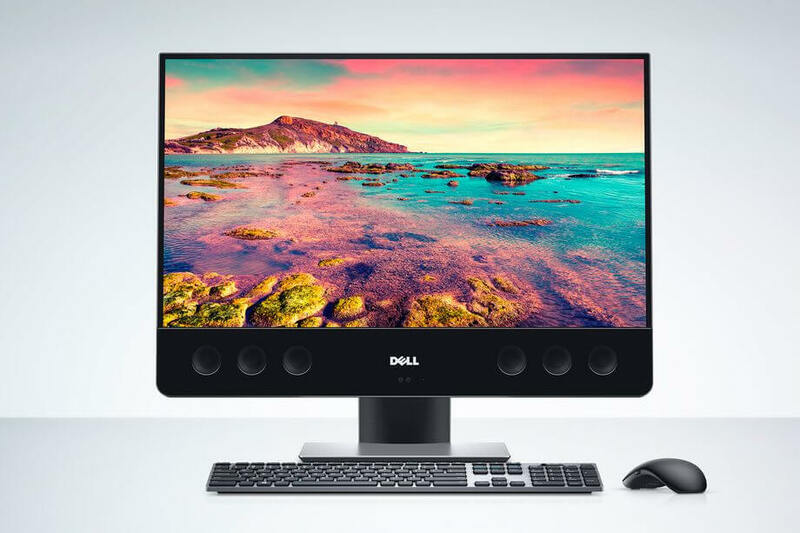 Dell has announced an update for its XPS 27 all-in-one that brings a new all-aluminum enclosure — a major upgrade from the hard plastic on last year’s model — as well as a 4K display, an adjustable base on the touchscreen model that allows it to tilt and move to a horizontal position, and perhaps the most significant addition, no less than 10 speakers — you can see six of them, lined up prominently under the screen, plus two down-firing units and two passive radiators for better bass. Dell’s audio system for the XPS 27 was engineered in collaboration with music producer Jack Joseph Puig and the result should be "the best sound for an All-in-one PC" according to the company. Considering the speakers that come built in with off-the-shelf systems rarely, if ever, cut it that’s probably a safe bet. For the display, Dell is using a 27-inch UltraSharp 4K Ultra HD (3840x2160) InfinityEdge IPS panel with 100-percent Adobe RGB colorspace, available in both touch and non-touch configurations. The XPS 27 is powered by a 6th generation (Skylake) Intel Core i7-6700 or i5-6400 processor, 8GB or up to 64GB of DDR4 RAM, integrated graphics or your choice between the AMD R9 M470X and M485X, and a range of storage options including up to 1TB SSD or 2TB SATA hard drive + 32GB M.2 SSD. In terms of ports and connectors, the XPS 27 features two USB-C / Thunderbolt 3 ports, five USB 3.0 ports, HDMI-out and DisplayPort 1.2, gigabit Ethernet, headphone jack, and SD card reader. Wireless connectivity is available in the form of 802.11 ac Wi-Fi and Bluetooth 4.0. Dell also throws in a Windows Hello IR camera that lets you sign in by sitting in front of the device. The XPS 27 all-in-one is available starting today from $1,499 and up depending on configuration.